Talk about adventures—there are millions of bubbles, races to be run, eggs to be found and performances to enjoy. Ready, set, go! Get ready for some fun, a run, and adventures with these top things to do this weekend April 12-14! #LetsGoLakeCounty. Get your spirits soaring and feet more than tapping with the return of the musical, “Footloose.” Based on the hit film and loosely on the true story of Elmore City, Oklahoma, come follow Chicago-teenage transplant, Ren, into a town that banned dancing for 90 years. This new-to-small town rebel wins over hearts (and feet), as he takes on influential Reverend Moore to bring back the art of rhythmic moving. With grit, great storytelling and dancing, the Tony Award-winning act is known for top-10 scores like “Almost Paradise,” “Let’s Hear It for the Boy,” “Holding Out for a Hero” and of course, “Footloose.” The musical runs through June 2. Friday-Sunday, April 12-14; Fri: 8 p.m., Sat. : 4 p.m. and 8 p.m., Sun. : 1 p.m. and 5 p.m. Tickets $50-$60. Marriott Theatre, 10 Marriott Dr., Lincolnshire. Friday-Saturday, April 12-13; Fri.: 8 p.m., Sat. : 6:30 p.m. Jon Anderson Tickets: $38-$63. Underwater Bubble Show Tickets: $26.50-$37.50. Genesee Theatre, 203 N. Genesee St., Waukegan. 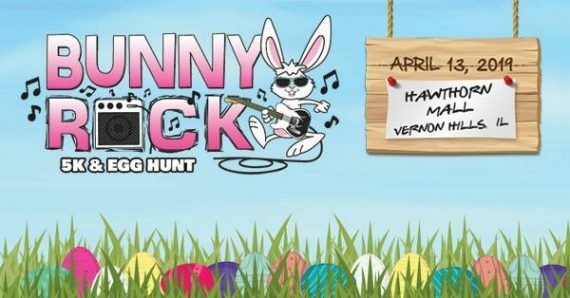 Come rock and run with the bunny, search for colorful eggs, at Hawthorn Mall’s new “Bunny Rock Hawthorn 5K Run and Egg Hunt.” This festive race is sure to bring lots of eggs-citement with 80s rock music, “bunny” swag, a petting zoo, photos with the Easter Bunny, an after party and more. Participants receive bunny ears, sunglasses, a dry-fit unisex T-shirt, a finisher medal and a basket to collect eggs. The egg hunt is for children ages 2-10. Saturday, April 13; Race Day Packet Pickup: 7 a.m. 5K: 8:30 a.m. Egg Hunt: 8:30 a.m. Registration: $10-$40. Hawthorn Mall, 122 Hawthorn Center, Vernon Hills. Libertyville’s Improv Playhouse presents “The Gathering,” a compelling and contemporized version of The Last Supper derived from Bible stories ogf the Books of Matthew, Mark, Luke and John. The story connects the 12 disciples’ reflections of their experiences with Jesus Christ. The dramedy unfolds as they compete for attention and status within the group. Audiences find this a relatable and impactful drama experience of the Christian faith-based journey. Sunday, April 14; 2:30 p.m. Tickets: $5-$20. Cash only at the door. Other dates (8 p.m.): April 18, 19 and 20. The Improv Playhouse Theater, 735 N. Milwaukee Ave., Libertyville. Get ready to explore! All ages can expand their knowledge of the unique physical and natural world at the Chicago Botanic Garden “Unearth Science Festival.” The fest highlights an array of themes and activities including the pollination process, a native bee habitat, exploring the galaxy with a planetarium expert, workshops, a film screening and a climate change update from WGN-TV Chicago Chief Meteorologist Tom Skilling. Most of the events are free, but workshops may require a fee. Adults have a chance to be a kid and “geek” out at “Science After Hours” on Friday. The Friday grown-kiddie event features many of the activities in the kids’ two-day fest, but the adults can sip on libation and eats that are available for purchase. Friday-Sunday, April 12-14; Science After Hours: Fri., 6-9 p.m. Unearth Science Festival: Sat.-Sun., 10 a.m.-4 p.m. After Hours Admission: $8-$12. Festival: Free-$10. Chicago Botanic Garden, 1000 Lake Cook Rd., Glencoe. Now, that’s sure a lot of great things, no foolin’! For more things to do this weekend, April 12-14, continue here.